When MTV made its debut on cable television on August 1st, 1981, I was spending my third summer at Kutsher’s Camp Anawana in the Catskills. A few weeks shy of my 12th birthday and my first kiss, despite having a mouthful of metal (if you must know, the lucky boy was Todd Goldman, who also wore braces), my introduction to the VJs and the trove of music videos that would make the music and artists I already loved – or hadn’t yet discovered – come to life, would have to wait. When I returned home, it didn’t take long for me to “want my MTV” – and, like everyone else fortunate enough to have cable, to get hooked on it. 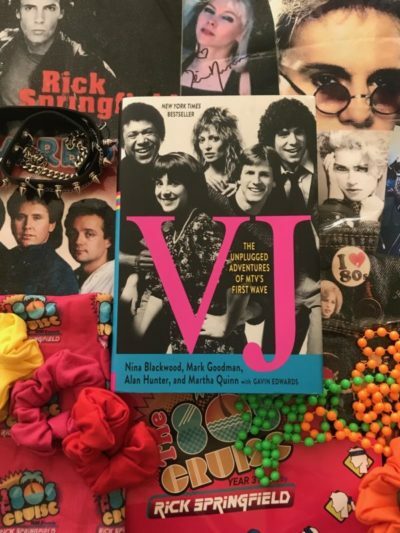 The VJs, Mark Goodman, Alan Hunter, Nina Blackwood, Martha Quinn, and JJ Jackson were the coolest of the cool. They became my older, virtual siblings, guiding me on a unique and multisensory journey that in many ways shaped and define my adolescence. The music videos they delivered to our living room television – and into my heart – were fuel for my hormones, inspiring everything from my wardrobe (I wore lace, rubber bracelets, one earring and a fake mole like Madonna) and my workouts (let’s just say I got physical with Olivia Newton John) to my locker and bedroom décor (pictures and posters of Madonna, Michael Jackson, Prince, and Billy Idol) to my lip sync selections (I “performed” Madonna’s “Dress You Up” and Belinda Carlisle’s “Mad About You” at my high school’s Superdance fundraisers).